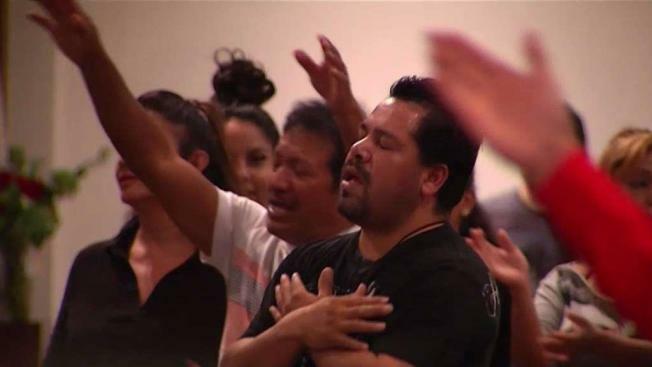 Hundreds of people gathered in the South Bay for a vigil Wednesday night, praying for those affected by the Mexico earthquake. Our Lady of Guadalupe Church has many members with family in Mexico, including Adriana Gonzalez Torres. "When I heard (the earthquake) hit the area where my mom came from, I got really worried,” she said. Gonzalez Torres has seven aunts and uncles in the Mexican state of Morelos, one of the hardest hit areas. When she saw images on the news, her mind focused on them and all of her cousins. Some were at work and school when the earthquake hit. She says several weren’t able to make it home until hours after. Late Tuesday night, her mother finally reached an aunt. Everyone was physically all right, but their homes were damaged. “They're gone, they probably have no food, no shelter, they don't know where to go,” Gonzalez Torres said. Her mother showed us a picture sent from the Mexican families. Their church in Morales is nearly destroyed. For people like Gonzalez Torres, Our Lady of Guadalupe will be staying open all night Thursday through Sunday. The church also will hold a special collection during Sunday Mass for the relief effort in Mexico.